How to get there? As an avid collector of airlines miles and credit card points, I naturally try to fly in a premium class (first or business) for as little miles and money as possible. Since I had a stash of American Airlines miles, I started searching for availability about 4 months before the trip. 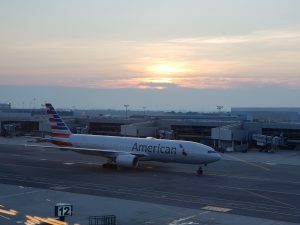 In order to spend as few miles as possible, I searched on the American Airlines website for “saver”(less miles) business class availability (on American Airlines there is no first class on flights to Brazil) from New York City (JFK) to Rio. While I found availability from New York to Rio at the one-way saver price of 57,500 miles, there was no saver availability on the return flight, nor was there any award availability (even at the higher “anytime” (more miles) level) from Rio to New York. There was, however, “anytime” award availability from Rio to Miami and onward to New York at a one-way price of 150,000 miles (ouch!). Since these flights cost between $5,000 and $8,000 round trip, I happily spent the extra miles. But wait! For the next 3 months before the flight departure, I kept checking to see if any “saver” award availability became available. Sure enough, two weeks before the departure date, “saver” availability opened up. I called American Airlines and told them to change my return flight to a “saver award”. The agent told me “There will be a $300 reservation change fee”(ouch!). I responded “Yes, but you will also have to return 92,500 miles to my account.” (the difference between the 150,000 anytime price and the 57,500 saver price) Score! With a business class ticket averaging $6,500, and a round trip saver award costing 115,000 miles, I will gladly make this $300 for 92,500 mile trade any day of the week! So the flight portion of my one month vacation in Rio was all taken care of! Stay tuned for more! Previous Previous post: Why take an MD80 when you can fly a 767 for the same price! Next Next post: Wheels Up!